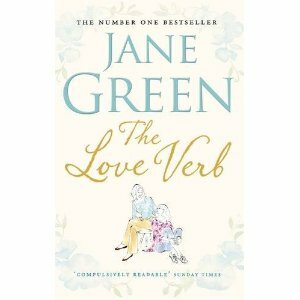 The Love Verb – Jane Green and a give away! This book was on my Christmas Wish List but last week I was in my favourite second hand book store purchasing some books as gifts, when I found it. ( I always do a mandatory check for which ever book I am currently on the look out for) and was very pleasantly surprised to find this one. Of course, I bought it, it was literally half price, which is a bargain! It is a beautiful heart wrenching book, it had me in tears in one section and I literally could not put it down. In fact, I read it in one day. I shirked all duties to finish it and loved it. It made me ponder on real life stuff, relationships, love, you know all the usual things one gets from a ‘chick lit’ author but it truly was an extremely sad, but uplifting book. Full of serious stuff but also the lighthearted, it really has a great balance. Love is not an abstract idea. It is not saying ‘I’m here for you, let me know if you need me’. It’s making the decision, when someone close to you is in trouble, about what you will DO to fix as much as you can for them. It’s a ‘doing’ thing. A verb. For Callie, love is about looking after her family – her husband and two children – and their beautiful home. For Steff, Callie’s younger sister, love is about experiencing all that life has to offer without having to ever settle down. For Lila, Callie’s best friend, love is about finding a soulmate. And when she meets divorced father-of-two Eddie, she knows her search is over. For Walter and Honor, Callie and Steff’s divorced parents, love is about caring for the daughters they share. Then Callie gets some life-changing news. And suddenly the whole family is about to understand what ‘love’ really, really means…. This book was dedicated to one of Jane Greens friends who passed away recently and if I were her friend, I would of been seriously impressed with this book. One of her best, for sure! So, in keeping with the festivities of this time of year, I have one copy of this book to giveaway. Open to anywhere in South Africa and all you need to do is leave a comment. Random.org will choose the winner on Monday 20th of December. Just think , you may receive another Chrismas gift that you weren’t expecting! The Forty Rules of Love by Elif Shafak, is breathtaking! Once I started reading it, I did not want to put it down. It truly is a book that every single person on this planet should read. The story is a simple one, with a book within a book. Ella is a married housewife with three children who starts a job as a reader for a literary agent. Her first book, is by Aziz Z. Zahara about the fabled poet Rumi and how his world view was transformed by the whirling dervish Shams of Tabriz. Ella begins to correspond with Aziz, bringing about a change to her world view. This story is written in such a way that it speaks to the average person, there is no judgement, there is only Love. 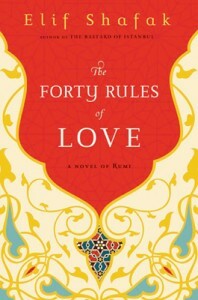 Of course, as one reads, one discovers the ‘Forty rules of love’ , hence the title of this novel. This is a classic and awe inspiring and it made me feel all warm and fuzzy. Yet, when I got to bed after having finished reading it, it left me pondering about Love. And why we as humans find it so difficult to open out heart. Why there is such fear from ridicule and the thoughts of others. If we all just opened our hearts and lived with Love, then the world would be a vastly different place. What I enjoyed about this novel is that it struck to the very core of me, and made me realise, that all we have is this present moment. This book is about Love. About Love of God, and of people. It challenges your opinions on Love and I urge you to find a copy and read it. Now.